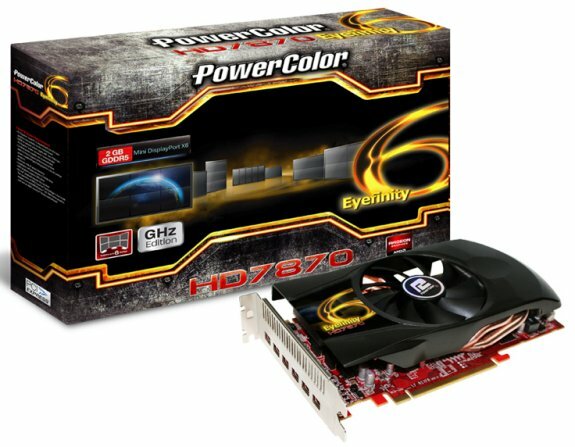 PowerColor introduces the Radeon HD 7870 Eyefinity 6, a new graphics card that simultaneously supports up to six displays. The card has a 1000MHz core clockspeed, 2GB GDDR5 memory clocked at 4800MHz and six mini-DisplayPort outputs. TUL Corporation, a leading manufacturer of AMD graphics cards, today releases the only HD7870 graphics solution which can support up to 6 displays simultaneously: the PowerColor HD7870 Eyefinity 6. The latest edition optimizes multi-display Eyefinity technology, enabling up to six monitors to be operated from one card through its six mini display port onboard design. This unique feature allows gamers to enhance productivity to get more things done at once, also delivering the most vivid HD gaming experience with wider view. The HD7870 Eyefinity 6 takes advantage of AMD PowerTune technology, enabling higher clockspeeds while needed through unused TDP headroom; by utilized AMD ZeroCore Power technology, allowing GPU to consume virtually no power in idle mode, delivering the best power efficiency. Also, with the support of AMD APP Acceleration, it creates a “co-processing” environment of GPU and CPU, simply speeds up the everyday applications.